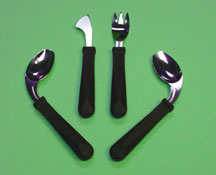 Melaware Adaptive Utensils designers had people with special needs in mind. These utensils are easy to grasp and designed to fit comfortably in any hand. Elderly people and people who have difficulty moving their hand or wrist due to arthritis, stroke, brain injury or other physical limitations can use Melaware utensils without help from caregivers. These "easy hold utensils" featuring tapered and angulated handles designed to make gripping cutlery as effortless as possible. The handles are made of a hard, dense plastic, measures 4-1/2 inches long and 1 inch in diameter at the base and taper to 3/4 inch. The unusually shaped knife blade will cut with both slicing and rocking motions with minimum effort. The knife blade is not designed for cutting tough meat. The spoons are angled for use with either the left or right hand. Use the right angled spoon if you're right handed or the left angled spoon if you're left handed. Ideal for persons with decreased wrist motion, arthritis, stroke or other physical limitations. The fork has three short, "v" shaped tines. Available in a set of three with your choice of either a left or a right angled spoon. have blue handles and the fork has a brown handle. For safe hygiene purposes, all eating utensils are non-returnable! 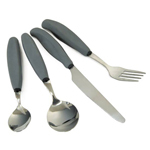 Essentials™ Grip Cutlery comfortably fits any size hand! 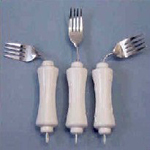 These special utensils are designed specifically for individuals with arthritis or some other condition that causes limited grasping or limited hand strength yet nice enough for everyday use. Suction Cup Grab Bar installs easily with no drilling required. Patented Safety Indicator tells you if you have a good suction. The grab bar can be placed anywhere on a clean, dry, SMOOTH surface. Suction portion of grab bar can't go over grout line..
UBend It™ Bendable Utensils are the perfect cutlery solution for people with upper extremity weakness or reduced range of motion.